On October 1st, my alarm clock went off bright and early. 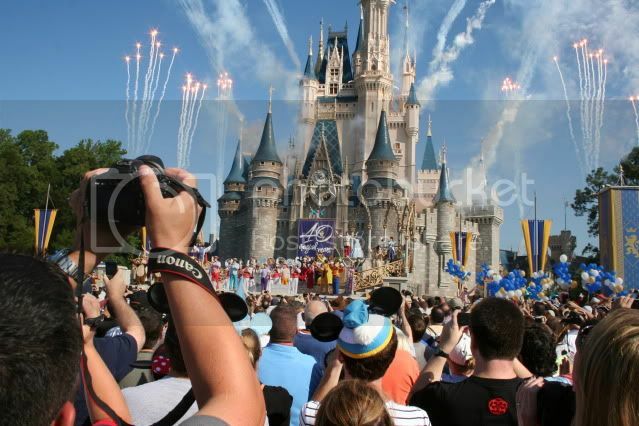 I was aiming to be at the MK for rope drop -- after all, it was Disney World's 40th birthday!! 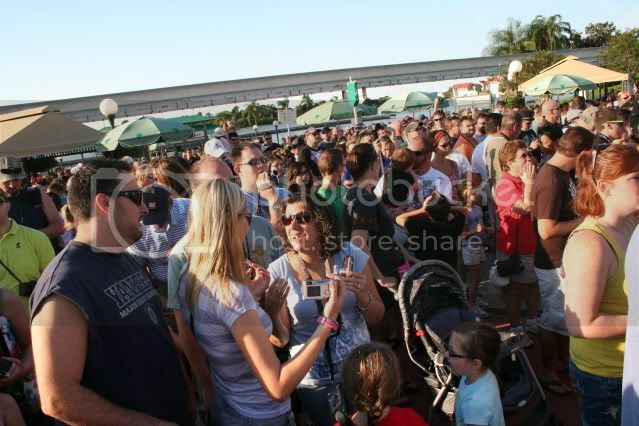 I was walking up to the main gates around 8:30 - I was meeting a friend and luckily she got off the monorail at almost the same time, so we were able to find each other in the growing crowd! 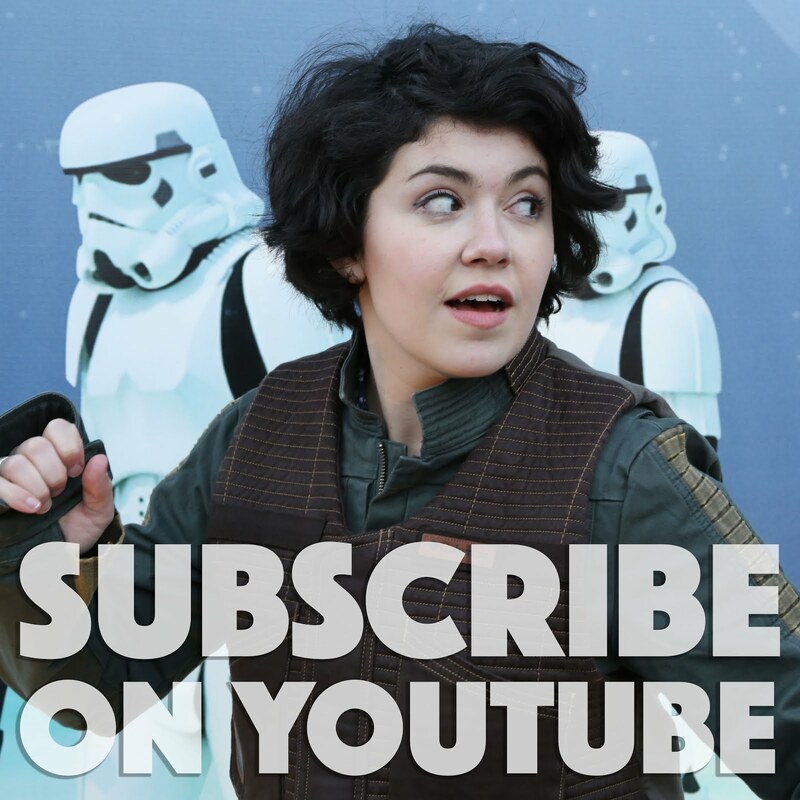 There was a 40th banner on the train station to greet us! The area between the turnstiles and the train station was completely full, they had just stopped letting people in. We queued up by a turnstile close to the center, so we could still see the opening show! 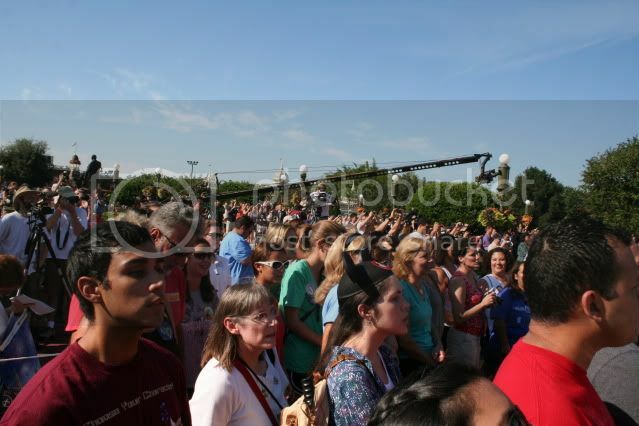 The area behind us quickly filled up -- there were so many people! 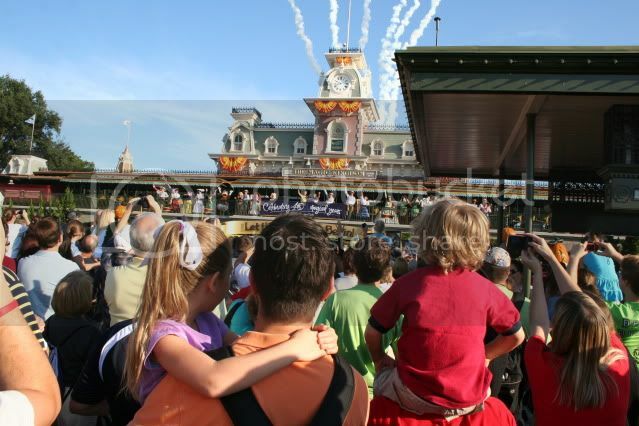 But everyone was so excited, and happy -- you almost didn't mind the crowds, they just added to the festive atmosphere. 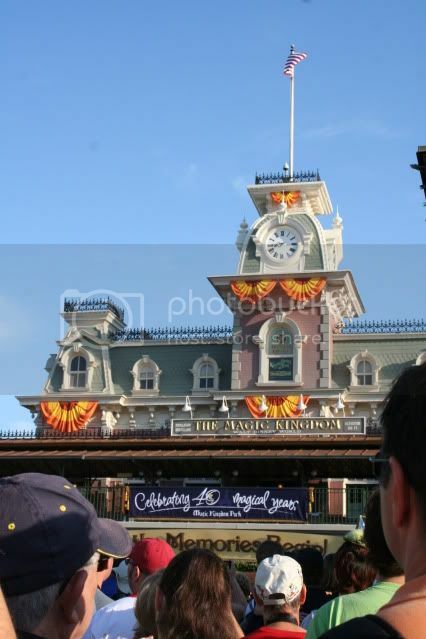 lol, and it was nice that we weren't running for any rides -- we were just going to mosey down Main St. and grab a spot to watch the 10 AM ceremony from. "Good Mornin'...Good MORNin'!" 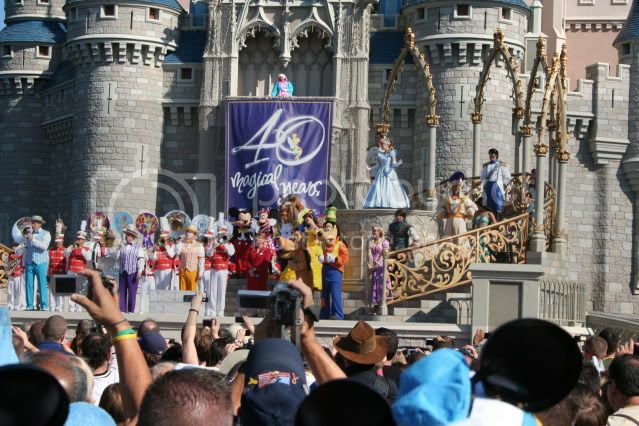 The mayor mentioned the 40th anniversary, but otherwise it was the same old welcome show. 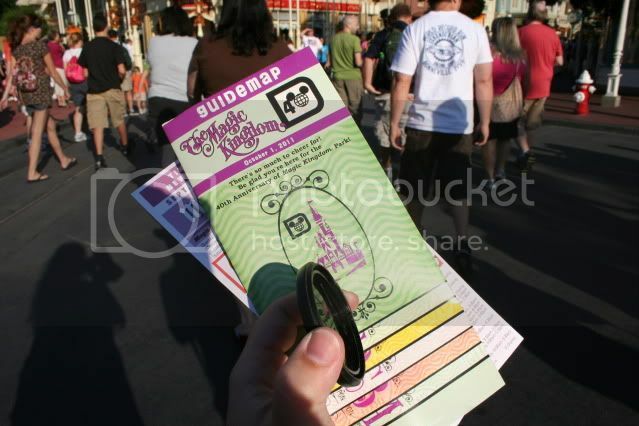 The special maps were a fun touch -- they had the ordinary park map printed in them, but also the original park map from the 1971 opening. 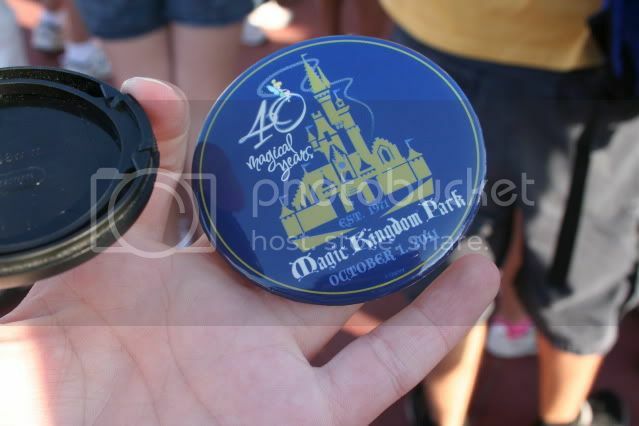 There was also a listing of the special events going on: really just the 10 AM ceremony, a special fireworks finale, and then locations selling the 40th anniversary merchandise. There were also some artist meet and greets. Not the best photo, but I was trying to get a shot of the line at the bakery...it already stretched out the door and along the street! There were supposed to be special 40th anniversary cupcakes on sale, but the CM's outside the door said they wouldn't be out until 11. So that line was just the hungry hoards getting breakfast! Everybody was heading for the hub to get a position. First we had to figure out what was going on though! 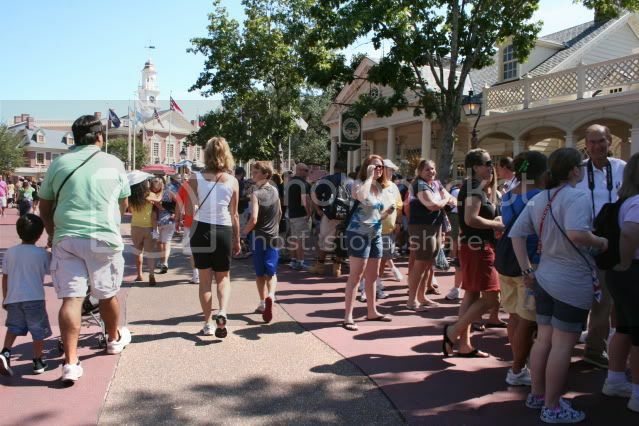 After cross-examining several cast members, it seemed that there was going to be a procession down Main St., and that it would split at the hub, half would go round one side, half the other. 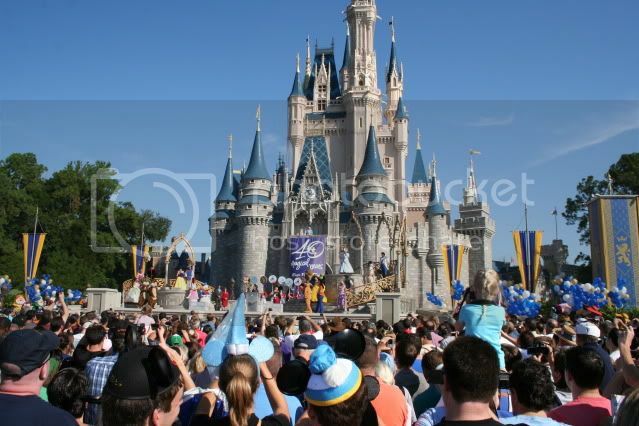 We decided to go right, to the east of the castle, and try to grab a spot where we could see some of the procession and the castle stage. Doesn't that castle look glorious? 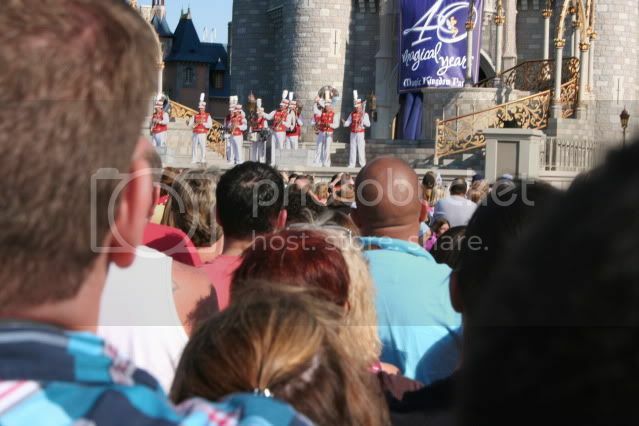 :) It was only just 9, but we got in our spot and stood and waited! Ironically, although the park was full, I bet all the rides were really quiet for that first hour or so! 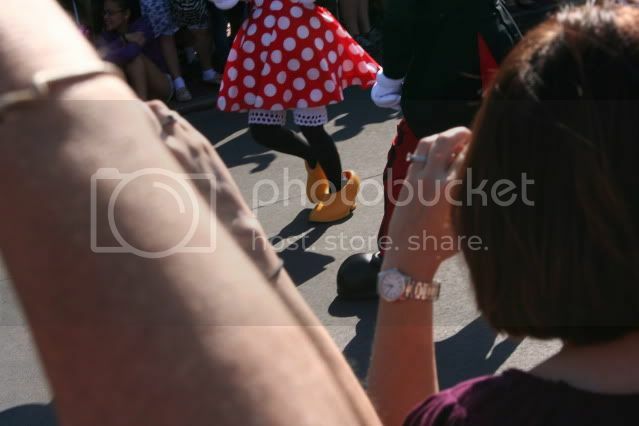 Everybody was getting in position to watch the mini parade and ceremony! While we were waiting we noticed there were people sitting up on top of those little awning things (lol, I have no idea what they would be called!) on either side of the castle. It looked like they were part of the crew, controlling lights of something -- but that would be a pretty awesome spot to sit and watch from! 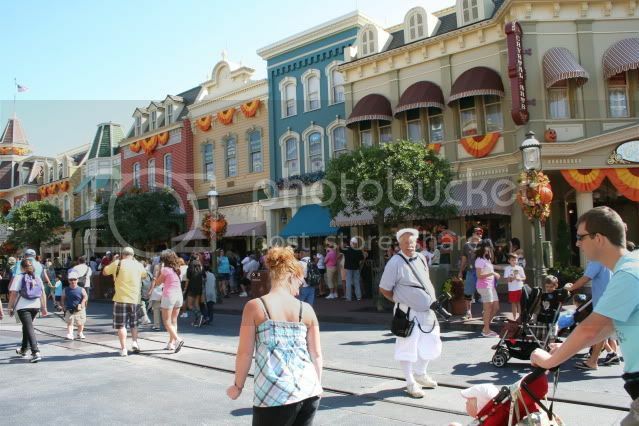 The area around the Partners statue in the middle of the hub was completely blocked off, and right before the procession began a bunch of press people (lucky ducks!) were led in to the spots in the middle. At around 9:40 the Main Street Band came out and played some tunes to entertain us. Then at 10 the festivities really began with the mini parade! 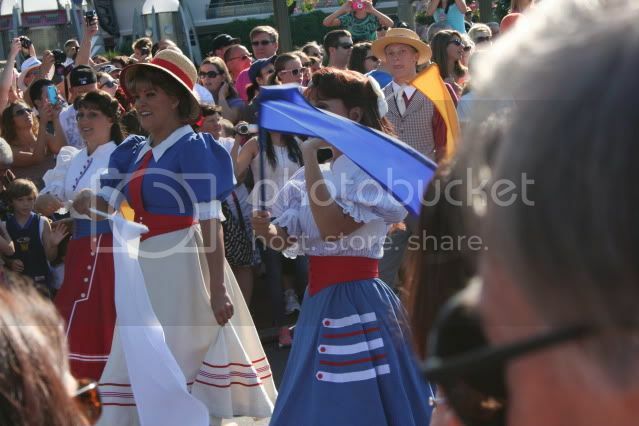 There was music from old parades and shows and the characters of course! We picked the right side to wait on! 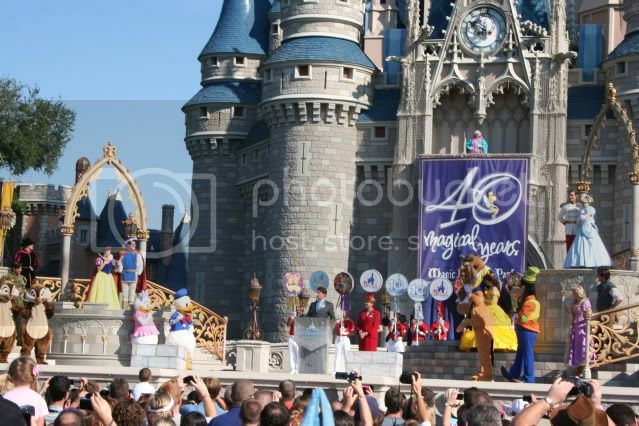 Mickey and Minnie, Pluto and Goofy, Cinderella, Ariel, Belle, Jasmine, and Rapunzel (and their attendant princes! 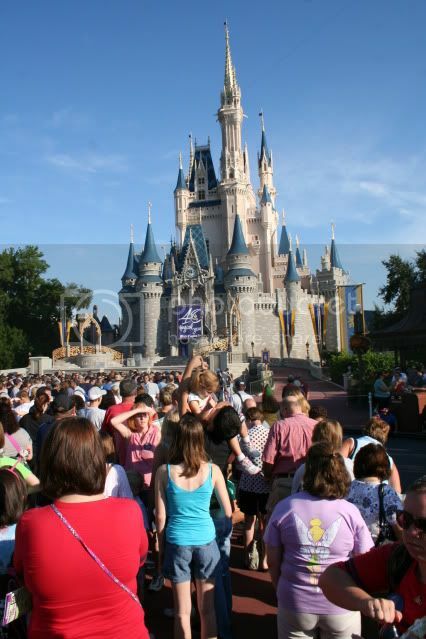 ), and plenty of others all came around the right side of the castle. 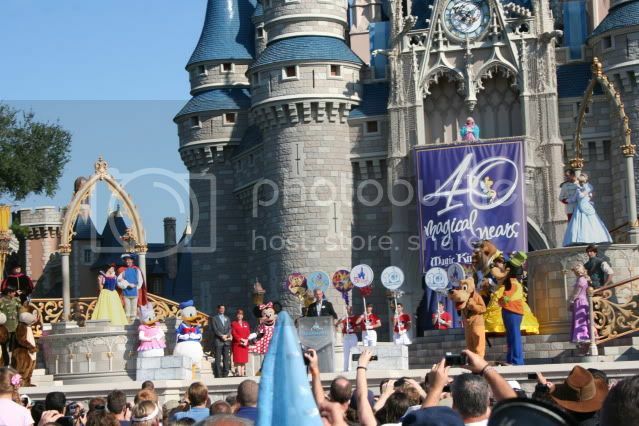 Donald and Daisy, the chipmunks, Snow White, Aurora, Tiana et al walked around the other side. It was so hard to get pics -- for the most part I was just holding up the camera and guessing! 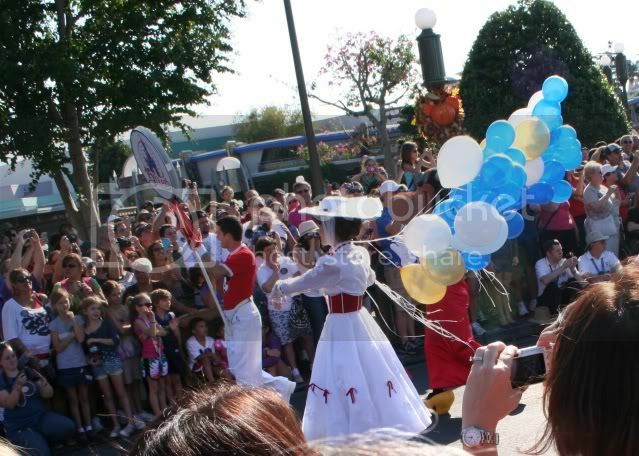 Lots of the characters were carrying big bunches of balloons -- they flanked the castle stage along the sides. 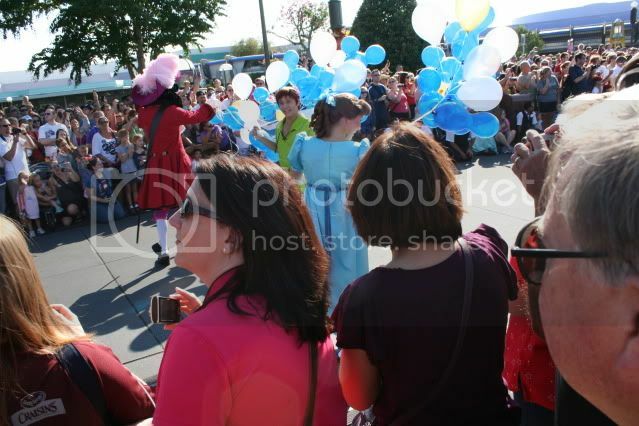 Mary Poppins and Bert (and Clarabelle Cow back behind those balloons too!). 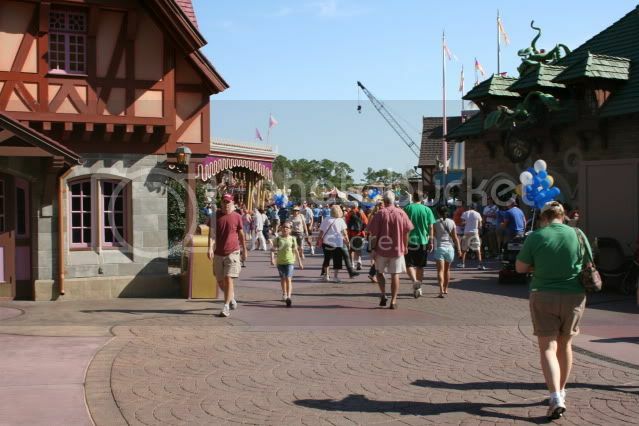 That fellow in the red shirt was one of the ones carrying the signs with the logos for old anniversary celebrations. 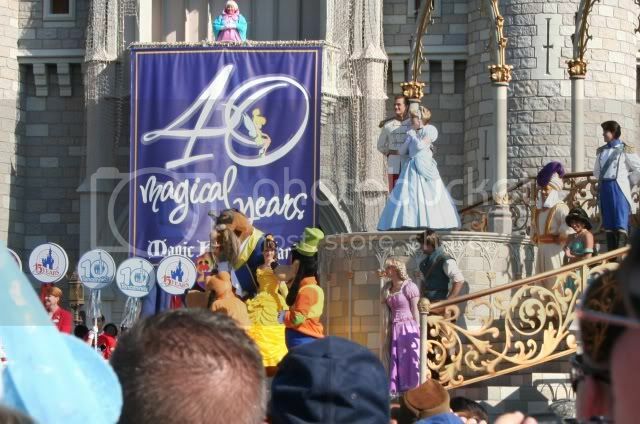 I got teary eyed when they played "Remember the Magic" from the 25th anniversary -- my family's very first visit was that year, and we loved that parade. I still know all the words. Yeah, I was totally singing along. It's Peter Pan - and Cap'n Hook too! 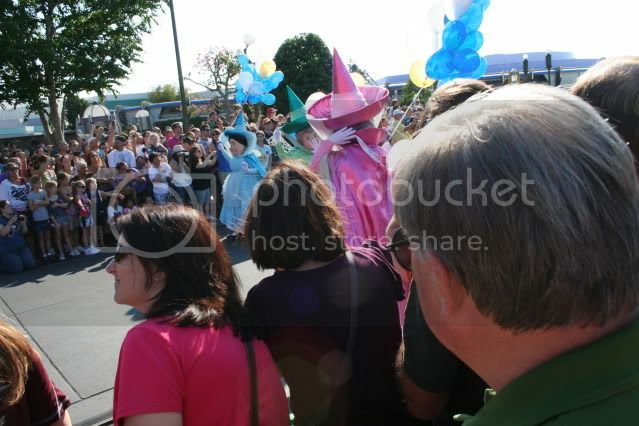 Flora, Fauna, and Merryweather going by! 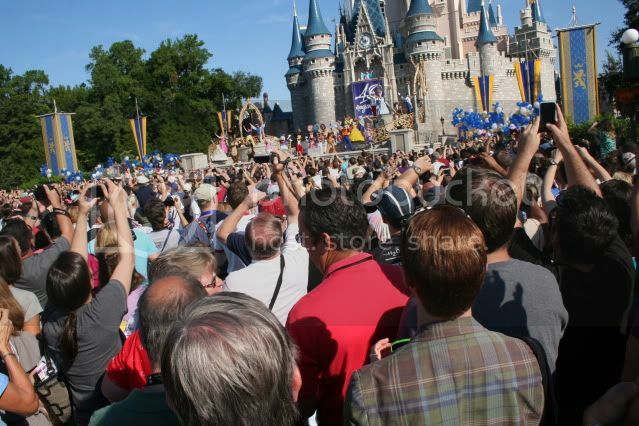 As soon as the characters and procession were all out of the street, they let the crowds move into the street, so everybody was pressing forward -- we actually wound up a lot closer to the castle and the center! I took waaaaayy too many pictures, but I figured you guys would enjoy them! Meg Crofton came out to speak a few words. My nice camera has a wide angle lens, which is why these shots aren't very zoomed in! 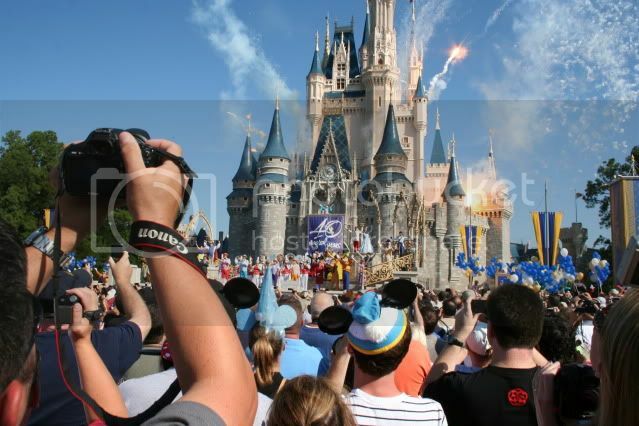 Anyway, this is the president of the Magic Kingdom. 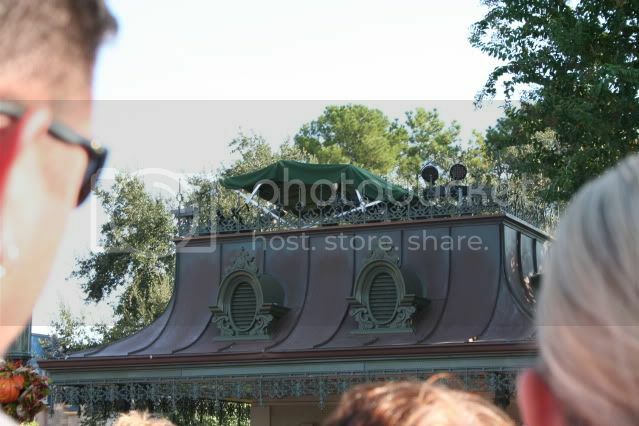 He also came out to speak a bit - he talked about how he had worked at the Haunted Mansion on opening day. 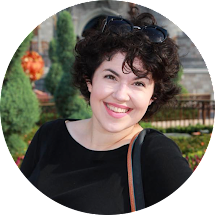 "If you got into the Haunted Mansion for an A ticket instead of an E ticket 40 years ago - you're welcome!" lol! 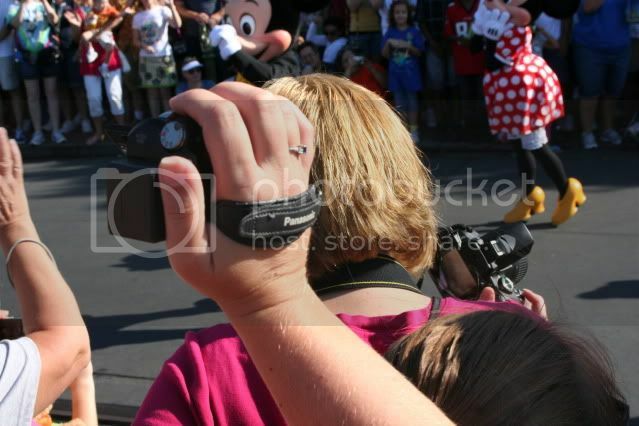 Cameras and crowds behind us! It was a really fun 40th ceremony! 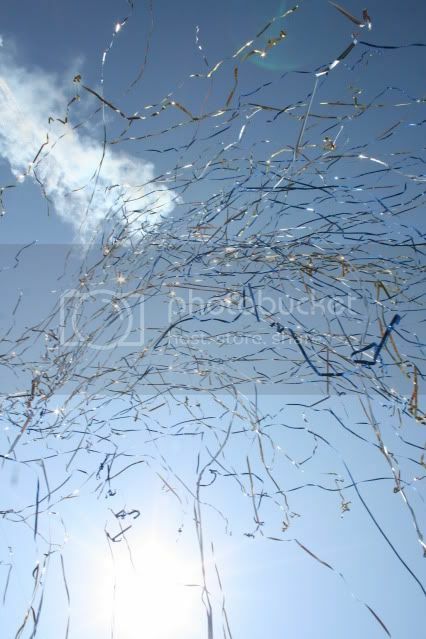 My friend and I grabbed some streamers and tied them on like sashes and wore them in the park for the rest of the day! 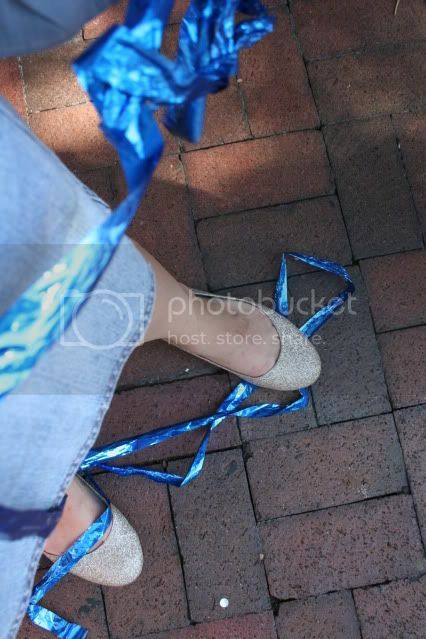 My sparkly shoes (a couldn't-resist purchase at Payless) and streamers! 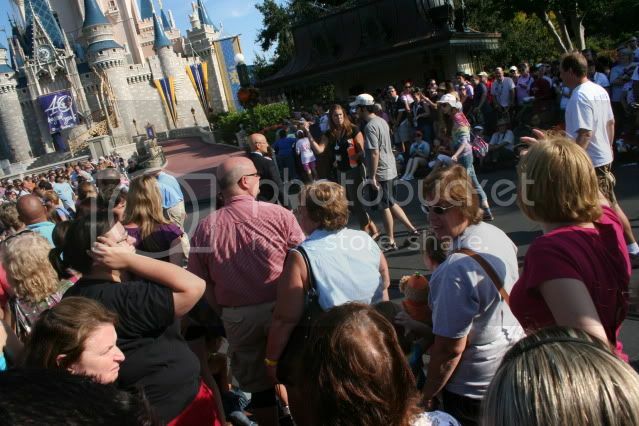 As soon as we could get clear of the crowds, we headed back into Fantasyland. 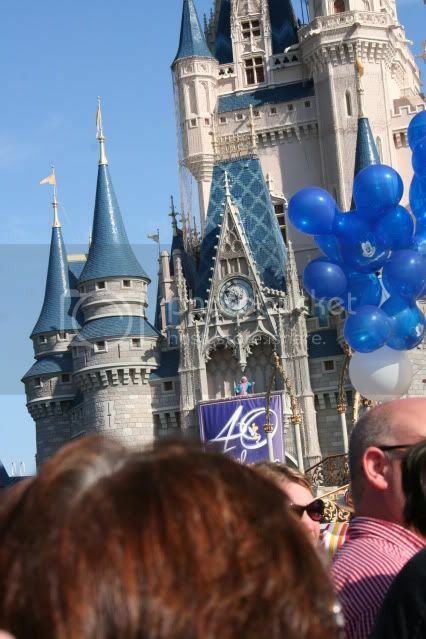 See those bunches of balloons scattered in the crowds? 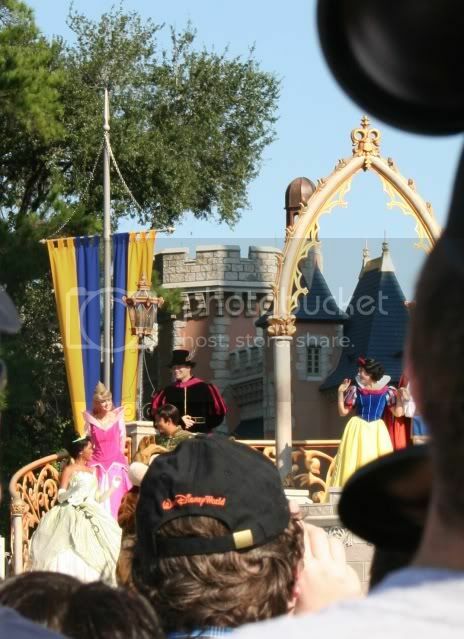 Apparently the characters came out and handed them to kids in Fantasyland right after the ceremony. SO JEALOUS. 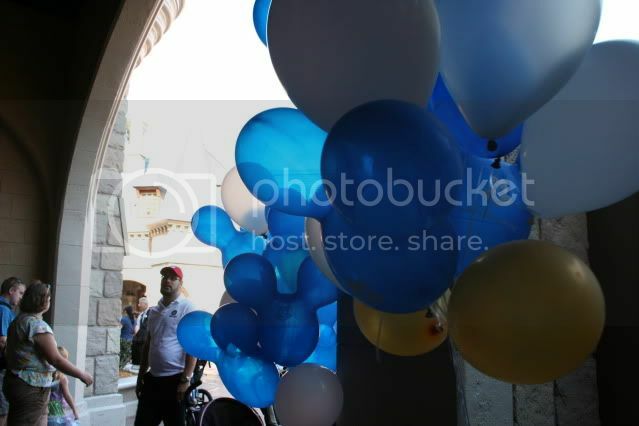 Those bunches had three mickey balloons a piece! 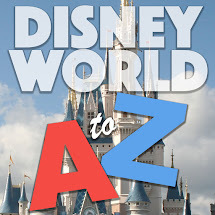 We had heard there were going to be special meet n' greets with characters to celebrate the 40th, so we set out to search for them. 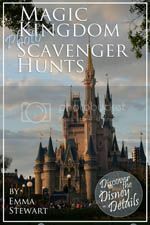 As it turned out, there weren't (BOO) - or at least we wandered around the park for an hour without being able to find any, and the cast members we talked to claimed there weren't any. Oh well. There was a horse out at the Town Square barn out to meet and greet! 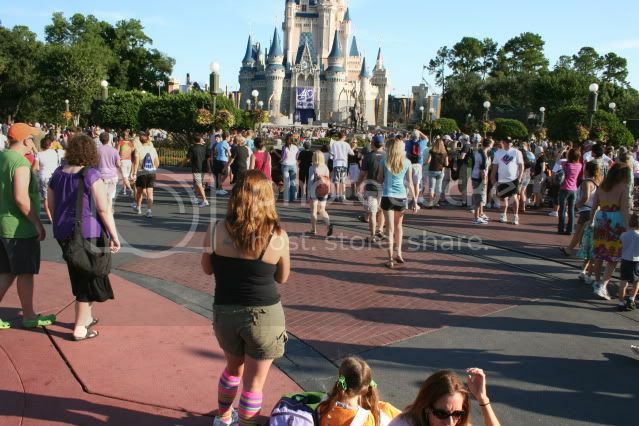 I had read online that WDW Radio was doing a 40hr show in the park that day, and we saw their crew chatting in front of the castle! 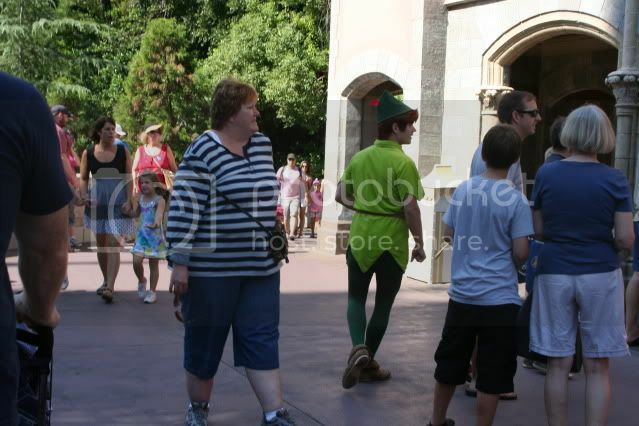 Peter Pan was walking over to Adventureland to his meet n' greet spot, without a character attendant or anything! In Adventureland there was also this funny-looking fellow strutting about. I loved his explorer pith helmet (my little brother Athos who loves dinosaurs and explorers REALLY wants a pith helmet like that!) -- I don't know who he was supposed to be though! We dropped by one of the shops in Frontierland -- it was full to bursting with people checking out the special pins out for the 40th anniversary. These were some of them. 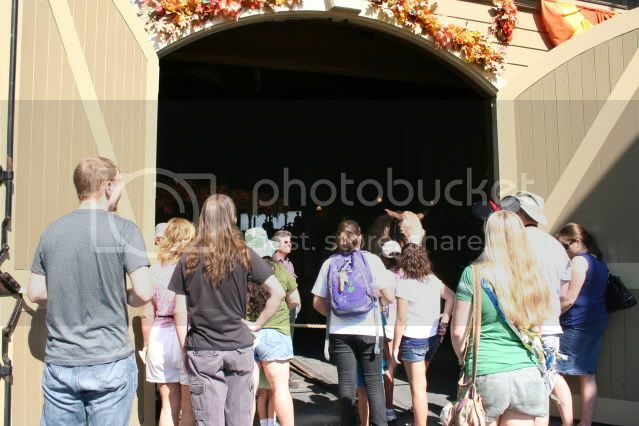 Another Frontierland scene -- the line waiting to meet some artists at the Diamond Horseshoe Saloon stretched all the way back to the Liberty Tree!! See that line hugging the building?? The one that stretches waaay down the street? 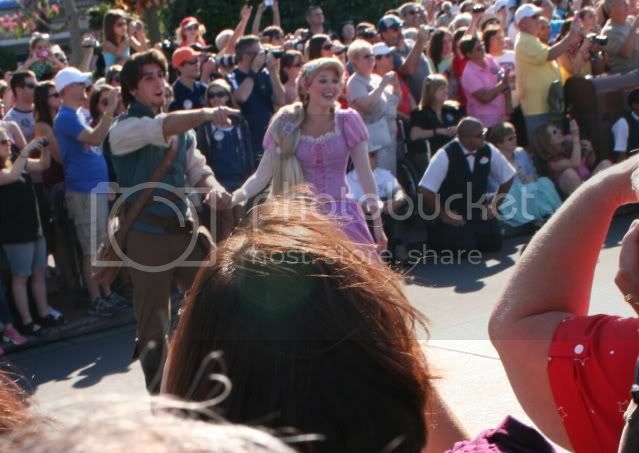 I think it ends with that lady in pink to the right of the photopass photographer. Yeah. 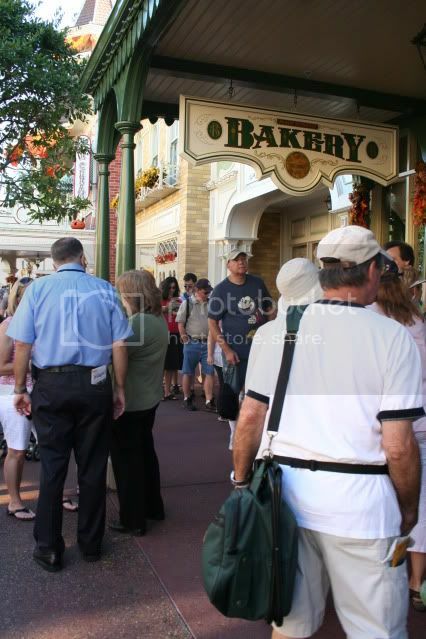 That was the bakery line. I'm sorry, but the cupcake just didn't seem worth it! We did actually see some cupcakes at the Confectionery (which also had a line as long as your arm) - we heard they were $5 and very ordinary -- just vanilla with colored icing and a little sugar square that said "40 years" on it. 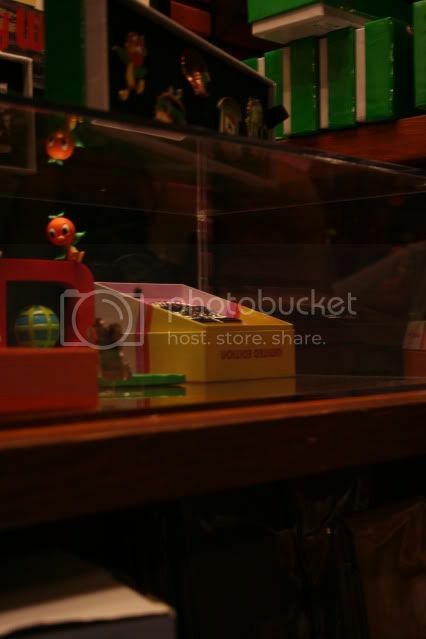 Those orange cupcakes on top of the counter were the special ones the Confectionery had. At the time it sounded like they were the same ones the Bakery had, but I later read on the Disney parks blog that the bakery ones were slightly more special. I headed out of the park slightly after that, and I ended up having a headache that night so I did not see the fireworks after all. :( Sorry! But I did watch a video of them on youtube, and it looks like those lights I thought they would use on the castle are in fact just Christmas lights. 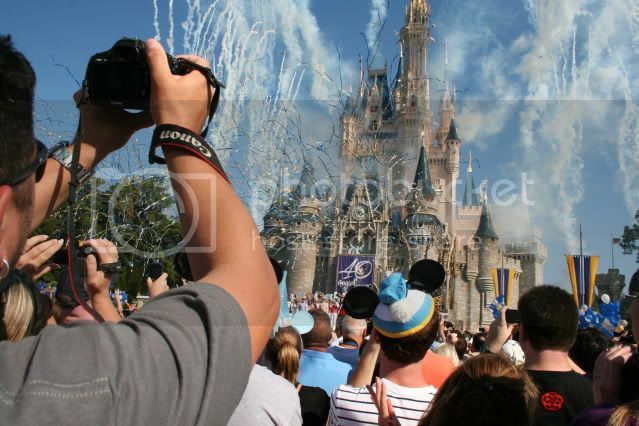 The only special thing about Wishes was that they added perimeter fireworks to the finale -- so they shot up the same fireworks they normally do, only times 6, all around the hub. Pretty cool, but I'm not sure it would've been worth braving the crowds again! Sorry for the length of this update -- I figured I'd get it up now since it's finished, but I'll definitely put up a cupcake post tomorrow! Until then, sweet dreams!